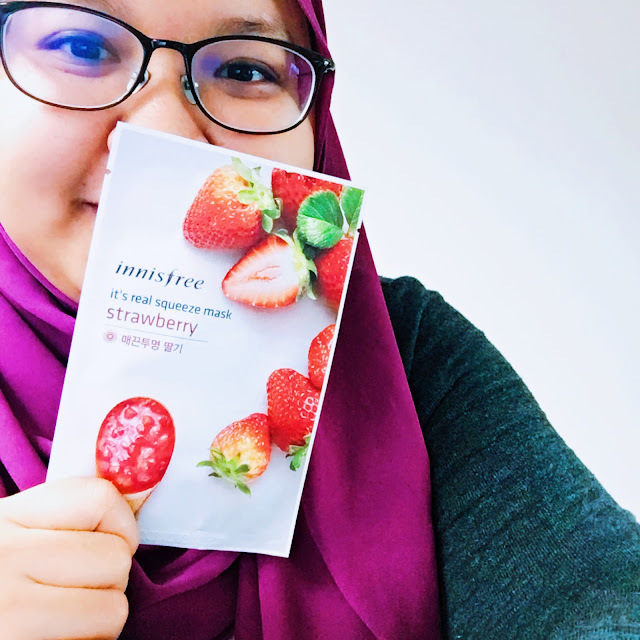 Speaking of stocking up masks, when I was in South Korea last year I was able to purchase a few piece of the Innisfree It's Real Squeeze Mask sheets. Initially, it was my best friend who asked me to get some for her, so obviously I also ended up getting a few for myself to try too! Honestly, the price of the masks there is so cheap it kind of drove me mad. What's better, my Korean friend Sue let me use her discount coupon, so I ended up purchasing them at an even better deal. 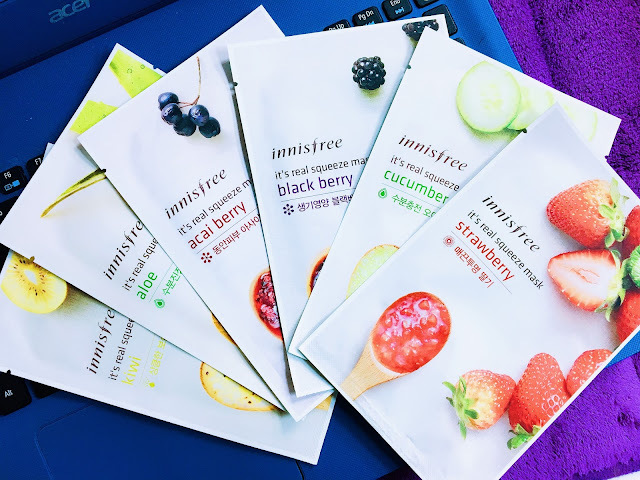 The varieties of these Innisfree It's Real Squeeze Masks is endless. It took me awhile to actually finish choosing which one would be perfect for my skin. I started off trying to read them one by one but let's be honest, I am too impatient. LOL. I ended up going with the ingredients that looked most interesting to me which are; strawberry, cucumber, kiwi, aloe, acai berry and black berry. The mask fabric is a three-layered sheet helps the masks to stay moist and increase the rate of absorption of the essence into the skin. The essences are made from freshly squeezed juices of plants obtained through the course of harvesting, extraction and refinement and then contained to provide the skin with freshness and health benefits of ingredients. (source). Other varieties that are available include; rose, rice, green tea, lime, bija, tea tree, pomegranate, shea butter, manuka honey, and bamboo. I think the masks are pretty amazing considering it's super affordable price. Even in Innisfree Malaysia, each piece of them is sold around RM4 per piece(20ml). The mask sheet is a bit thinner comparing to other masks that I've tried and unfortunately, one of it was torn off while I'm trying to put the on (and i was being gentle). There are plenty of essence inside of each pack and they are not sticky either. I didn't experience any weird reaction or tingling while putting it on so I would say that they are pretty gentle on sensitive skin. Overall: I would give this product a 4/5, and I would definitely be repurchasing them again in the future.